Ellie’s passion for the outdoors stems from the many hours spent at her grandparents’ cabin and numerous family camping trips as a child. During those trips she developed an enduring love for hiking, fishing, and wildlife. These experiences led her to become amazed by how much there is still to learn about the world around us. From as early as 7th grade, she knew that she loved studying Life! She continued to grow her interest by participating in science club, a regional science fair, and eventually going on to college to study field biology. In college, Ellie taught several summer camps and soon realized that not only did she have a passion for biology, but also for sharing that knowledge with others. 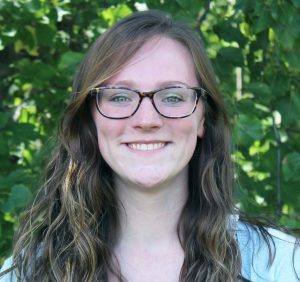 While her degree is in biology, Ellie focused her college course work and honors projects around science education. It was her goal to be able to turn complex scientific ideas such as stem cells and human genomics into fun, easy to learn lessons. Through RMB, Ellie has worked with Lake Volunteers around the state of Minnesota; educating them about lake health and water quality monitoring. She has also had the opportunity to work on the Minnesota Department of Agriculture’s Targeted Township Testing Program. This program gave her experience working with counties and homeowners all over Minnesota to educate others about proper nitrate levels in drinking water. During the summer, Ellie enjoys getting out of the office to collect stream and lake samples for water chemistry analysis.